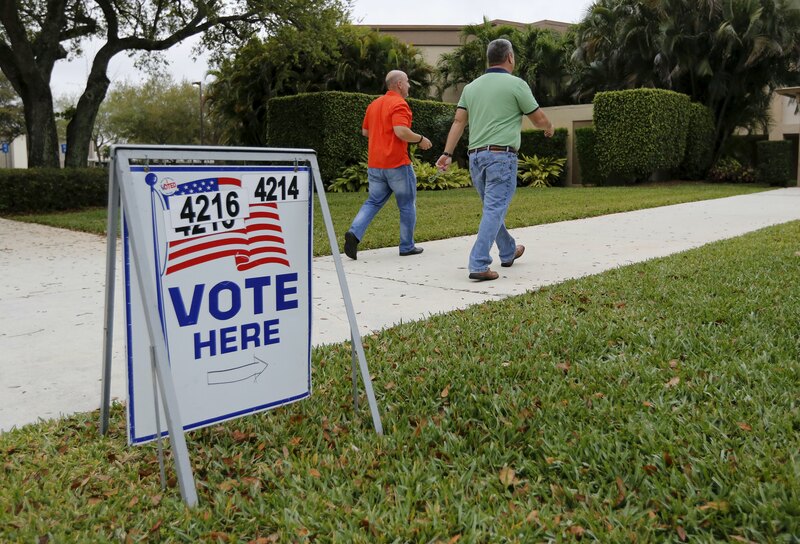 Election Day may be on Nov. 8, but many voters will be casting their ballots before then. Thirty-six states plus the District of Columbia offer some form of early voting, that is, where rules make it convenient for a voter to cast a ballot prior to Election Day without the requirement for an excuse to do so. Early voting could mean setting up polling stations for people to vote or allowing voters to pick up a ballot and cast it in one place before the election. Nine states deemed battlegrounds by CBS News have this type of early voting. How Sizeable is the Early Vote? The share of voters who cast their ballots before Election Day has been rising since the turn of the century. In 2000, just 16 percent of votes were cast early or by absentee nationwide for president, but that figure more than doubled in 2012 to 35 percent (representing about 45 million votes). Whether as a matter of convenience or to avoid potentially long lines on Election Day, many voters are choosing the early option. That figure could reach 40 percent this year. In the last two presidential elections, the Democratic Party has been pretty effective in mobilizing its supporters to vote early. In 2012, for example, President Obama carried the battleground state of Iowa largely due to the early vote. Mitt Romney actually won among those who voted on Election Day, but it wasn’t enough to overcome Mr. Obama’s lead among early voters. There was a similar pattern in North Carolina – Mr. Obama won the early vote and Romney the Election Day voters - although Romney prevailed and won the state. Other battlegrounds like New Hampshire and Pennsylvania don’t have “early voting” per se and an excuse in needed to vote by absentee ballot, therefore, fewer votes are likely to be cast before Election Day in those states. Various kinds of voters cast ballots early. Some older voters may take advantage of voting by mail or at a time when the lines may be shorter. Voting early is popular in the African American community as well. In 2012 in North Carolina, 74 percent of African Americans who voted cast their ballots before Election Day, compared to 63 percent of white voters who did the same, according to exit poll estimates. Some counties in North Carolina have cut back on early voting which could have an impact on who turns out early. How Does Someone Vote Early? There are a different ways to cast an early ballot. Some states set up official polling stations -like Election Day - where voters can cast a ballot in person during a specified time period. In other states you can pick up a ballot, fill it out, and drop it off all in one place without an excuse, sometimes known as “in person no excuse- absentee voting”. This is often done at a county office. There is also vote-by-mail: Oregon and Washington have conducted elections by mail for years. When Does All This Early Voting Start? A handful of states such as Minnesota and South Dakota begin in-person absentee voting on Sept. 23, but Iowa is the first battleground state to start voting early on Sept. 29. More than 40 percent of Iowa’s votesfor president were cast early in 2012. Ohio is next on Oct. 12. Absentee ballots may be made available in some states far ahead of the election. On Friday, North Carolina starts mailing out absentee ballots, but people won’t really be casting votes yet. The bulk of early votes will be cast later -- early voting in most states will take place in October. The early voting dates and time periods will likely have an impact on which states candidates campaign in and when. Will We Know Anything About the Early Vote before Nov. 8? While we won’t know the candidate preferences of early voters before Election Day, we may learn something about these voters. In past elections, states like Iowa and Ohio have released information on how many voters have cast an early vote, or how many absentee ballots have been requested and returned, which would provide an estimate of the size of the early vote. And some states release information on the number of early votes cast broken out by political party. In those cases, we may have an indication as to which campaign has been more successful in getting their voters to the polls early.